Here I listed some ways to start studying the Bible more. It was a message addressed to women, but the same goes for men. I wish also to recommend some further works, geared toward those who prepare Bible studies. Calvin’s work is indispensable. For those who would prefer it in print form, go here. There are lost of helpful comments here from Reformed writers. This set is a steal at this price. For the OT, this is also a steal. I always read these commentaries (among many others), when I prepare a sermon. This is a bit pricey: get individual volumes from this. See my commentary recommendations for which are good. This is an excellent deal, with many fine volumes indeed. For more background information on the NT, go here. Only two OT volumes are out: Pentateuch, and Historical. These can be found cheaper here. My seminary bookstore will match any internet price on something they have in stock. But to get a bigger idea of Scriptural truth, we need more than just exegetical works. We also need systematic theology. Turretin is masterful. Murray is also very helpful. Calvin, of course, is essential. Hodge is suprisingly easy to read and helpful. And that is the best price you’ll find anywhere. Bavinck is also important: here, here, and here. Volume 4 will be out sometime this year, Lord-willing. For those wanting to study the Dutch tradition, Ursinus is absolutely foundational, in addition to Bavinck, listed above. Last, but not least, read Muller. He destroys the tired, old “Calvin versus the Calvinists” school, in addition to telling us about scores of Reformed authors who were amazing scholars, but strangely have not been translated. Loads of good stuff here on my favorite book of the Bible. Of the forthcoming commentaries, Hafemann, Martin, and Wilkins will probably be conservative; Green and DeSilva will be moderate, and Horrell is an unknown to me. A man takes his Bible, opens it at random, and points to a spot on the page. That spot says, “Judas went out and hanged himself.” Then he did the same thing again, and came up with this passage, “Go thou and do likewise.” After doing it a third time, he saw this, “And what you do, do quickly.” Another person goes to his astrologer for information on the future, so that he might know what fate has in store for him. Another person throws the dice, trusting in fate. Many people will claim to have a direct revelation from God about something in their life. What is common to all these people is this question: “How can I know what God’s will is for my life?” How can I know beyond a shadow of a doubt what God’s will is? How can I know whether or not this is the right person to marry, or whether or not I should take this business deal, or whether or not I should plant wheat or corn this year? We are not talking about something that is unimportant. These affect our whole lives. We have seen Abraham’s ups and downs. We have seen him in faith, and we have seen him in doubt. But at the end of his life, there is no doubt left. He knows exactly what God’s will is for his life, since God has revealed it to him in His Word. Scholar Gordon Wenham says it this way: “He comes into history through the divine promises; he passes out of history with this promise on his lips.” Abraham’s command to his servant is the last recorded thing that Abraham says in Genesis. We see him live for awhile longer after Isaac acquires Rebekah. However, this is the last speech of Abraham. It is the last will and testament, if you will. The first nine verses tell us of Abraham’s commissioning his servant to go and find a wife for Isaac. The most important thing about this commission is that the wife must not be a Canaanite, but must come from Abraham’s own kin. This practice of marrying only relatives is called “endogamy.” Any Israelite hearing this would immediately have understood the significance of this. Israelites were only to marry other Israelites. They were never to marry the foreign women either of Canaan or of Egypt. In the same way, Christ only married the flesh of His flesh and the bone of His bone. Those who are married to Christ are those who believe in Him, and are therefore the children of Abraham, as Paul says in Galatians. Paul says in 1 Corinthians 7:39 that we must marry only in the Lord. Young people, this is directly addressed to you. You will be wondering about whom you are to marry in this life. You’ll be wondering about what God’s will is. Here part of God’s will: marry only in the Lord. It should not be even a remote option to marry someone who does not know Jesus as Lord and Savior. That should be your very first concern, as it was Abraham’s. Notice his vehemence about the topic: verse 3: Abraham wants the servant to swear by the Lord, the God of heaven, that the servant will not try to find a wife for Isaac from the daughters of the Canaanites. He even makes his servant place his hand under his thigh in confirmation of this. Probably the phrase “under the thigh” is a euphemism for the male organ of procreation: what Abraham is saying is that the servant must swear also by the offspring that comes from Abraham’s own loins, ultimately, by Christ Himself. Now, the command here to marry only in the Lord does not limit us to people only in our own denomination. The church is one universal church. The key here is whether that person believes in Jesus Christ as Lord and Savior apart from any works of their own. That person must believe the Gospel. If that person does not, then you may not marry that person. Victor Hamilton says it this way, “If Isaac is to inherit the land, he must not marry among those destined to disinherit the land.” So with us today: if we are going to inherit the entire earth, then we must not marry anyone who is not destined to inherit the entire earth. Differences in religion are perhaps the most difficult to overcome. It is hard enough marrying someone from another denomination. But to marry an unbeliever means that religion becomes a taboo subject and a source of strife between the married people. Abraham knew this; Jesus Christ knew this, and so must we. Young people, take note! The second scene shows us the servant at the well, having gone a long way with these ten camels loaded down with presents. Then the servant utters a prayer. This is most instructive for us. We cannot know God’s leading hand without prayer. Notice, though, that the servant does not presume to know God’s mind. He does not put God to the test. Instead, he petitions the Lord to show him the way. We have seen, then, two ways in which we can know the will of God: God’s Word, and prayer. Jesus Christ was the premier example of this. In the garden of Gethsemane, the Lord of Glory talked with His Father. If Jesus felt the need to pray to His Father, even while being close to the Father already, how much more do we need to pray to God. It is a certainty that those closest to God will always be those who are most in prayer to God. The servant chooses something quite shrewd to petition the Lord about. He knows that Isaac needs a hospitable wife, who is humble and kind. This sign is rather remarkable. A camel, after it had been on the road for that long, could drink 25 gallons of water. The servant had ten camels. This would require 250 gallons of water. The average pot in those days could hold about 3 gallons of water. Hence the person who would do this would take slightly over 83 trips down into the well to get the water back up again, bringing a total of 1500 pounds of water up from the well, three-quarters of a ton. He was asking for something rather extraordinary. Verse 15; as if on cue from the Lord, Rebekah walks onto the scene, even before he had finished speaking. The Lord answered the servant’s request even better than he had asked, because this girl was not only of the right genealogy, and of the right disposition, kind and generously hospitable, but she was also beautiful! Rebekah was probably a teenager at this time, much younger than Isaac, who was forty years old at this time. The next scene takes us to an introduction of someone who will be quite important for the rest of our study in Genesis: Laban. Laban is a greedy man. This is evident from verse 30: As soon as he had seen the nose ring, and the bracelets on his sister’s arms…he went out to the man.” Literally, he ran. This servant is a friend worth cultivating in Laban’s eyes! One almost gets the impression that he is relieved that the servant has not gone elsewhere. There is an implied contrast between Laban and Rebekah. Rebekah runs to take care of other people’s needs, even animals’ needs, while Laban runs to take care of his own pocketbook. The servant, though, far from being interested in his own concerns, such as his own hunger, hurries to do his master’s bidding. This starts the third scene of the chapter. He will not eat until he has found out whether his enterprise is successful or not. He repeats most of what we already know. We might ask why Moses felt it necessary to repeat so much information that we already have. The answer is that we can actually learn a few things from the servant’s account. We learn that he is tactful. He does not mention the fact that Abraham left his father’s house. Instead, he concentrates on the fact that they are related. After al, it would be much more difficult to refuse the request of a person who is related to you than a person you don’t know at all. The servant also leaves out mention of the fact that Isaac did not come along with him. Isaac was not supposed to leave the promised land, and there is no record that he ever did. At the end of this record, Laban says in effect that this is a match made in heaven. The customary bride-price was exchanged, and then they spent the night there. But what is unusual is what happens next. Normally, after a marriage contract was drawn up, there would be a feast or a celebration of some sort, usually lasting about ten days. But the servant wants to get home. First, he is very excited about the success that God has granted him. He is also concerned lest he arrive home after Abraham passes away. There is always that possibility in his mind. So he asks if Rebekah can come with him now. That is a question for Rebekah to answer, and her answer sparkles with faith, “I’ll go.” When God called His people, they are supposed to go immediately. When Jesus called the disciples, they were supposed to go immediately. When God calls us to something, we should not delay in fulfilling the commandment. When Rebekah left her father’s house, she might not have known for sure what the reason was for this leading of God’s. She little knew that the reason was that she would be the progenitor of Jesus Christ. Her line leads to Jesus Christ. In fact, this whole episode can be seen in the light of Christ pursuing His church, through his messengers, the missionaries of the church who say to the prospective bride, “Come.” Will you come? You need it. Abraham knew the importance of the promise. He knew that the promise given to Adam of a Seed that would crush the serpent’s head depended on the promise to Abraham being fulfilled by God. We have here in Genesis 24 a stage in the solution to the sin problem. It is a picture to us of Christ marrying His church both as a whole, and as an individual. Don’t delay in coming to Christ. That is not the way of faith. Don’t say, “I can come to Him tomorrow.” There might not be a tomorrow, as the servant knew of his master Abraham. Lastly, we come to the fourth scene of our little drama: the marriage act itself. He is meditating in the field, probably about whether or not he will have a wife when the servant comes back. He lifts up his eyes, and she lifts up her eyes at the same time, and they see each other for the first time. She asks if this is the man. Then she puts on her wedding veil. That is the signal to Isaac that this is the woman brought for him. She replaces Sarah as the matriarch of the tribe. That is the significance of his bringing her into Sarah’s tent. Notice one little detail: Isaac is now the master of the servant. Just as Abraham is the master of the servant, so also is Isaac. Just as God the Father is the God of all missionaries, so also is Jesus. Will you go into the tent of Sarah? That is, will you go into the tent of the church? Will have the church for your mother? It is said that you cannot have God as your father without also having the church as your mother. So, the question of guidance comes up again at the very last. How do you know what God’s will is? You see what is written in God’s Word, not by “lucky-dipping” as the man did picking scriptures at random. No. You read carefully, understanding what it meant to the original readers, how it shows us Christ, and how it applies to us as a result. You pray to the Lord, recognizing that no one can know the will of God without talking to him. But then you must recognize that it is God’s program that is God’s will. We so often think of what we want as God’s will, and we twist all the facts in order to come to that conclusion. However, that is not wise. God’s program is for us to know Jesus, and to do what Scripture commands us to do. That is God’s will for your life. All you really need to know about God’s guidance can be summarized in this one sentence: God is faithful, so obey Him. Whether or not that seems likely to work is not your business. Being faithful to God’s revealed will is your business. Read, pray, be humble, and come to Christ. I really honor and admire old people. They often have terrible circumstances in which to pass the remainder of their lives, and usually they are very lonely, especially if they are in a nursing home. However, there are things that they can do, and ought to do. The old people I admire the most are the ones who are never done living until they die. There are some old people who coast along in their old age. They go downhill fast. I do not have very much admiration for such people. Old people ought to learn new things that they didn’t have time to learn before. I know of a woman who started memorizing her Bible at the age of 65, and she never stopped until she had the whole thing memorized. Anyone who thinks that they cannot do that have one single obstacle in the way of doing it: themselves! They need to keep going: keep walking with God, walking period! They need physical exercise, and mental exercise. If they do that, then they will continue to have productive lives. The ones who do not do that are destined to go downhill and pass away. Use it or lose it. James has a good number of commentaries on it, but it also has some really good ones awaiting publication. Of the forthcoming commentaries, Doriani, George, McCartney, and McKnight will be conservative; Allison and Green will be moderate; and Kloppenborg will probably be liberal. It has been said that a person does not know how to live unless they know how to die well. We only think that we know how to live. The reality is that as a culture we do not know how to die. The stories that you hear about people dying indicate that they do not know about eternal things. They have had their minds so set on earthly things, that when they are faced with eternity, they do not know what to think. They do not know that they need a relationship with Jesus Christ. This chapter tells us about the promises that God gave to Abraham. Abraham believed them so much that he was willing to pay a very high price for a piece of that promise. As he was willing to buy that field with the treasure in it, so must we be ready to do so. The chapter starts out with Sarah’s death. This is a real hardship for Abraham, who has been married to her for most of his life. As any of us know who have had this happen, it disrupts our entire life to lose a loved one with whom you have spent so much time. Everything changes. Abraham knew this, and yet he knew the value of the promise that God had made to him. Even the death of his wife was not going to stop Abraham from pursuing the promise of God. The chapter focuses far more on the funeral arrangements than on the actual death of Sarah. The reason for that is that the piece of land that Abraham winds up purchasing is part of the promise land itself. This is the first-fruits of possession, as it were. Abraham wants a piece of that land. Matthew 13:44 say this: “The kingdom of heaven is like treasure hidden in a field, which a man found and covered up. Then in his joy he goes and sells all that he has and buys that field.” So, the question for us today is this: are we willing to sell everything that we have to go buy that field, the field of promise? It will look like the field where Christ was crucified. But that is our treasure. Abraham bought a slice of the promised land, the land where Christ would one day live, die, and come to life again. That is the treasure that Jesus was talking about in the parable. It is the treasure that Abraham wanted above everything else, and it is the treasure that we should pursue with all our might. Let’s look at the details. Notice first that Sarah died in Hebron, and that that is the place where the grave is located. This is significant. Hebron is the place where Joshua and Caleb had spied out the land, and then told the people that they could conquer it. It is also the place that Caleb later received as his inheritance. And it is the city over which David ruled first, as the first-fruits of his inheritance of the kingship from the Lord. Hebron has great significance in the history of Israel, as a result. Abraham first mourns for his dead wife. There are some people in the Christian world whose motto is, “Real Christians don’t cry.” This is a terrible motto, since it implicates Jesus Himself, who wept when Lazarus died. It is highly unnatural to deny our grief. We should instead allow ourselves to grieve at the death of a loved one. Grief is part of this world in which we live. Matthew Henry says that when a body is sown into the grave, it must be watered with our tears. Death is a terrible thing. That is why Abraham says that he wants to bury her out of his sight (verse 4). Because death has taken her, she quickly becomes unrecognizable. However, we must remember that death exists because of sin. That means that death is the true nature of sin revealed. If you want to know what sin really looks like, then look at death. All the decay, corruption, and hideousness of sin is revealed in death itself. Scripture says that sin gives birth to death. Death is the final form of sin. It was Adam’s sin that brought death into the world. Satan would have us think that sin is fun. Our sinful nature would want us to think that as well. But the truth of the matter is that sin is death. It is just as hideous as death. The next time we are tempted to sin, we should think of death’s hideousness, and remember that Christ went to the cross to undergo the penalty of sin, which is death. It was our sin that put Him there. Remembering this is part of the grace that God gives us to conquer our sin. We see Abraham negotiating with the Hittites about this portion of land. Notice that Abraham says that he is but a sojourner, passing through. That is why he wants something that he can call his very own. But the Hittites already know Abraham’s worth. They call him literally the prince of God. What they say would lead someone to suppose that Abraham could bury his dead in any of their tombs. However, they did not say that Abraham could just have some land. This is the way Ancient Near Eastern bargaining went on. Compliments fly thick and fast, but no one is planning on giving anything to anyone. You might have that impression just from reading this passage. However, there are a few clues that indicate that no one is giving anything away. Nor does Abraham want to get anything for nothing. That is why is says that he will pay full price for the cave at the end of Ephron’s land. Notice that he doesn’t want to get in anyone’s way, either. It is not in the middle of anyone’s land, but it is at the end of the field. The selling of land was a public event, which was why it had to happen in the hearing of everyone belonging to the village. Now, verse 11 is a puzzle until you learn how those people do things. Ephron first offers it as a gift. But gifts were notoriously unreliable in those days. Just because someone gave you land doesn’t mean that you will get to keep it. It meant that the person you gave it to was now in your debt. Arabs will always offer it as a gift. But then they expect you not to take advantage of the offer, and make an offer. So, in normal negotiation, you would first offer it as a gift, and then you would offer an enormous price for the first round of bargaining, always saying that that is such a small price to pay among friends, making sure that that left you with some wiggle room. That is what is happening here. Ephron knows that a good deal will come, if he plays his cards right. Furthermore, he includes the field along with the cave. He knows a good opportunity when he sees it. Abraham was only interested in the cave, but Ephron wants to sell him the field as well. Verse 15 says it all. Ephron says that it is worth four hundred pieces of silver, but what is that between friends? It is important to know that this was an enormous price for the field. What Ephron was expecting was a very low offer from Abraham, and then they would haggle their way toward a middle price. That was the way things were done in those days. So Ephron must have been very surprised indeed when Abraham agreed to Ephron’s asking price. After all, when it comes to burying the dead, it is not fitting to haggle over the price of a burial plot. Abraham buying the plot meant that he owned it free and clear. All the Hittites of the area knew that the land belonged to Abraham. So here is the question for us. Are we willing to do anything to have that down payment on the Promised Land of the new heavens and the new earth? Are we willing to give up anything for it? Are we willing to give up our favorite sins? Are we willing to give up anything that gets in the way? Jesus says that we need to count the cost of discipleship. You don’t start a building project without knowing how much it is going to cost. Otherwise, you might wind up with a half-finished building. Martin Luther said that a religion that gives nothing, costs nothing, and suffers nothing is worth nothing. Christ gave up His all for you. Will you not give Him your life in return? This post is not really addressing gender issues per se. It is rather addressing a crying need in the church today. That need is for women who understand their Bibles. There is a great hue and cry in the church today for women to live biblically. This is all well and good. But how can that happen without women knowing their Bibles? The impression one sometimes gets of women in the church is that they are supposed to be ignorant of Biblical truth. Biblical truth? That’s for men, many say. Balderdash. Women are supposed to know their Bibles, both for their own spiritual growth, and for the growth of their families. If the woman of the house is well-trained in biblical truth, she can discuss Bible truths with her husband, questioning him and having give-and-take conversations and debates with him. And there is inestimable benefit for any children, since they will receive constant biblical training from their mothers. Okay, some might be convinced that this is a good idea. But does one go about doing it? I think a lot of people would want to do something about their ignorance, but they don’t know what that would be. I would say that the first place to start is simply reading. There is no substitute for simply reading the Bible. And don’t get stuck in Leviticus; keep on reading through it. Even if you don’t know what it means, keep reading. The more you read, the more connections will be established, and you will start to see the big picture. However, along with reading, it is helpful to have a few good tools. A good Bible Dictionary is absolutely essential. It will tell you all about places, names, dates. It gives good overviews of Bible books, and, most importantly, can direct you in how a theme wends its way throughout Scripture. A good concordance is also essential. Next, a good book telling us what it’s all about can be very helpful. Not only does it tell us what the Bible is really saying, but it also helps us in telling us how to intepret Scripture’s truths for ourselves. None of this requires us to be scholars. Lastly, you need a good commentary that can be your guide through the text of Scripture. Matthew Henry is as good as it gets for non-scholars. Buy it. Every house should have this commentary. Here are some helpful starters. If you are still hungry for more, then you need to hear godly men expounding Scripture. Covenant Seminary has done an unprecedented thing by putting all these lectures on the internet. You can get an almost complete seminary education for absolutely free. Cheers, and start digging! There are a great many excellent commentaries on Hebrews. Pride of place goes without a doubt to Owen’s seven volume Puritan commentary. What he doesn’t know about Hebrews, rabbinical works, and arguing that Jesus is the Messiah, isn’t worth knowing. Of the forthcoming commentaries, all but Alexander will be conservative. I don’t know about Alexander, but the series is moderate to liberal. It wasn’t nothing to Abraham, who would have known exactly what John Griffith was feeling. God had already asked him many years before to sacrifice his past, by going out of the land of Ur of the Chaldeans, and going to the land which God would show him. But now God is going to ask him to sacrifice the future, his own son. God is testing Abraham. But wait just a minute! I thought James says that God does not tempt mankind. This is true. But God still puts us to the test in order to strenghthen us. Therein lies the difference between how Satan tempts us and how God tests us. Notice that I used a different word. Satan tempts us in order to destroy us. God tests us in order to strenghthen our faith, and to make us more reliant on Him alone. God never had any intention of letting Abraham kill his son. It was rather to be a spiritual sacrifice of Isaac, giving back to God what God had given to him. What does God say to Abraham? He says, “Take your son, your only son Isaac whom you love, and go to the land of Moriah, and offer him there as a burnt offering on one of the mountains of which I shall tell you.” Notice that God is extremely specific about this command. God doesn’t want Abraham to keep on thinking about the other son. It is Isaac who is meant. When God says “your only son,” He does not mean that Ishmael doesn’t exist anymore. He merely means “the only son you have left.” God says “whom you love.” The expulsion of Ishmael in the last chapter means that Isaac has only grown more precious in Abraham’s eyes, because he is the child of the promise. I don’t know what I would do if God told me to do that. But chances are I wouldn’t be so eager to do it as Abraham was. Notice how obedient he is! He gets up early in the morning. He doesn’t let any grass grow under his feet. Abraham knows that this must be done. However, his mind is in an absolute turmoil. We can see that from the order in which he does things: first he saddles his donkey, then he gets two servants, and then he gets his son Isaac, and then makes them stand around while he goes and cuts some wood! We can perhaps forgive him, because he’s just a little bit preoccupied! Abraham is not just concerned about sacrificing a son. That is horrific in and of itself. But there is much more to the problem in Abraham’s mind. This was the whole ball-game! Isaac was the future! Isaac represents our future, too, by the way, since Jesus is Isaac’s descendent! (We are not to think of ourselves as outside this story; rather, this IS our story!) God had promised and brought about Isaac’s birth against all odds, and now it was all to be thrown away. God tells Abraham to go to Moriah. Moriah is the place where the temple is located later on in Israel’s history. Every sacrifice offered there would be a reminder of Isaac’s sacrifice. It takes Abraham a long time to get to Moriah. Three days is an eternity, when you are thinking about having to give up your child. John Calvin notes that God made it this way so that Abraham would have to persevere in his obedience. It was not to be a spur of the moment obedience. Abraham would have to keep on doggedly pursuing the end of his dream. To an Israelite, this would have sounded just like their promises. God had promised to them to take them out of Egypt, and then God tested them in the wilderness. Interestingly, they were to go out for three days into the wilderness to offer a sacrifice. This similarity would not have been lost on the average Israelite who had come out of Egypt. For Abraham, those three days would have been pure agony. What an eternity they must have seemed! Finally, he lifted up his eyes (he probably had his eyes mostly on the ground), and then immediately had a pang shoot through his heart, much like John Griffith when he looked up and saw his son. There was the mountain! But Abraham does not falter. He even has a statement of rather amazing faith: “We will come back!” He means that he and Isaac will come back. This is what Paul means in Hebrews, when he says, “By faith Abraham, when he was tested, offered up Isaac, and he who had received the promises was in the act of offering up his only son, of whom it was said, ‘Through Isaac shall your offspring be named.’ He considered that God was able even to raise him from the dead, from which, figuratively speaking, he did receive him back.” But this is getting ahead of ourselves. We are not there yet. Notice that Isaac has to carry the wood on his back. This is much like Jesus carrying the cross on His back. Abraham and Isaac continue without the disciples- I mean, servants-, and go on in silence, one of the most eloquent silences in all of literature, says one author. Not quite silence, however. Isaac asks Abraham a question that must have pierced Abraham more deeply than ever his knife would have pierced Isaac. The question pierces to the heart of the issue, “Where is the lamb?” Abraham speaks better than he knows. Right now, he thinks that God is providing Isaac for the burnt offering. However, even this answer must have made Isaac suspect that he himself was the lamb. By the way, Isaac is not a young boy, if he can carry wood up the side of a mountain, enough wood for a burnt offering. It is far more likely that he is in his late teens or early twenties. Isaac is far stronger than Abraham. This insight leads us to another: Isaac’s faith is just as powerful and strong as Abraham’s in this chapter. He trusts his father implicitly. “He was led like a lamb to the slaughter, and like a sheep that before its shearers is silent, so he opened not his mouth.” Isaiah 53:7. When Abraham starts getting everything ready, Isaac knows at last that he is the lamb. He does not bolt, or overpower his father, or do anything else. Instead he let himself be bound. This word for “binding” is interesting. It is the word from which the Jews get the title for this chapter, the “Aqedah.” Normally sacrifices were not bound, especially not burnt offerings. They were slaughtered first. Thus, there was no need normally for the sacrifice to be bound. Here, however, we have a type of Christ, who was bound and flogged, and yet did not complain. J.R.R. Tolkien talks about the situation when all looks the very blackest that it can possibly be. Everything looks like a complete catastrophe is about to occur. But right at the very moment when disaster is supposed to come, salvation occurs. He calls this “eucatastrophe.” The two letters “eu” mean “good” in Greek. So it is a “good catastrophe.” That is exactly what happens here. 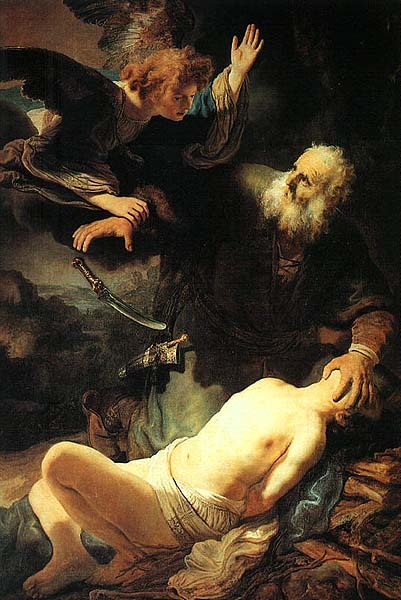 God stops Abraham from killing his son. Instead, a ram is put in Isaac’s place. Notice that the ram also has ties to Jesus. The ram was caught by the horns in a thicket, much like Jesus had a crown of thorns. The ram was a substitute, just like Jesus. So the ram and Isaac were both types of Jesus, who combined the two into one person. In verse 12, we see God saying that He now knows that Abraham fears God. Notice that God did not say, “Now I know that you believe in Me.” He says, “Now I know that you fear me.” Abraham feared God more than he feared losing the promise. The reward was nothing less than the promise of the church. It says in verse 17 that the seed of Abraham will possess the gates of its enemies. Jesus would confirm that promise by saying that the church of God would prevail against the gates of Hell itself, surely the greatest enemy. God even swears by Himself, telling us just how firm this promise is going to be. Now God doesn’t learn anything new here. The language might make us think that God didn’t know before, but now He does. That is not what the language means. It rather means that God knows now in an experiential way what he knew before in His mind. He knows now in the fruit what He knew before in the root, as one writer says. This “eucatastrophe” is a picture for us of what happened to Jesus on the cross and at the resurrection. Just when we thought that the picture was blackest, and Jesus had actually been crucified and died, unlike Isaac, who had been spared (thought the sacrifice had to be made: hence the ram), the resurrection breaks through with breathtaking power and beauty. It is nothing like anything we have seen before. Truly the Lord provides. It was not nothing to Abraham. He would have knows the hurt of John Griffith. But Abraham had the hope of the resurrection. So for us, what we need to do is to offer our bodies as a living sacrifice to God, for this is our logical act of worship. Because of what Jesus has done, who is the greater Isaac, we need to offer our bodies as living sacrifices. That might mean giving up perfectly good things that are getting in our way. It might also mean that we have to give up our favorite sins. As Gurnall says (modified), “Soul, take your lust, your only lust, which is the child of your dearest love, your Isaac, the sin which has caused most joy and laughter, from which you have promised yourself the greatest return of pleasure or profit. If ever you want to see my face with comfort, lay hands on it and offer it up. Pour out the blood of it before me; run the sacrificing knife of mortification into the very heart of it. And this freely, joyfully, for it is no pleasing sacrifice that is offered with a countenance cast down. And all this now, before you have one embrace more from it.” He goes on to note that these lusts do not lie on the altar nearly as patiently as Isaac did. This is difficult. However, it is the price of Jesus’ sacrifice for us. If we have been spared, when Jesus, the pure Lamb of God, was sacrificed, then we are bought with a price. There is no sacrifice so great that we will put God in our debt. “Is it nothing to you, all you who pass by?” It had better not, or God will pass you by. For all the commentaries on Philemon that are bound with Colossians, see here. I will just list them here for convenience: Bruce, Harris, Garland, Martin, Melick Muller (bound with Philippians), Vincent (bound with Philippians), Dunn, Lohse, Moule, O’Brien, Wilson, N.T. Wright.